Formalin-fixed and paraffin embedded human colon carcinoma labeled with Anti-XTP4 Polyclonal Antibody, Unconjugated at 1:300 followed by conjugation to the secondary antibody and DAB staining. Increases cell migration by inducing filopodia formation at the leading edge of migrating cells. 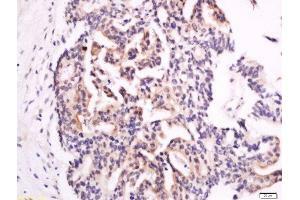 Plays a role in regulation of apoptosis, possibly through control of CASP3. May be involved in a redox-related process (By similarity).